Richard made and fitted the architraves for the front door. Then he went on to make two lengths of oak trim with a rebate for the LED lights we purchased from eBay. The first will be fitted above the front door and illuminate the cratch. 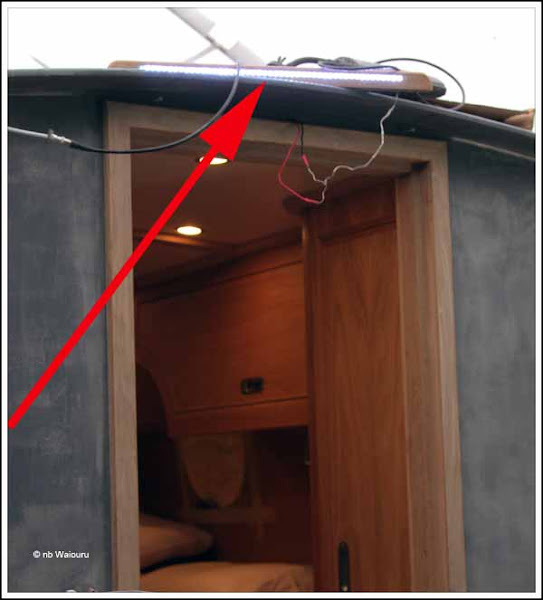 The light will be fitted immediately above the door lintel and face down. Actually, the Empirbus system needed to be re-configured as the light came on automatically. Moreover no switch was assigned so the light was permanently on. 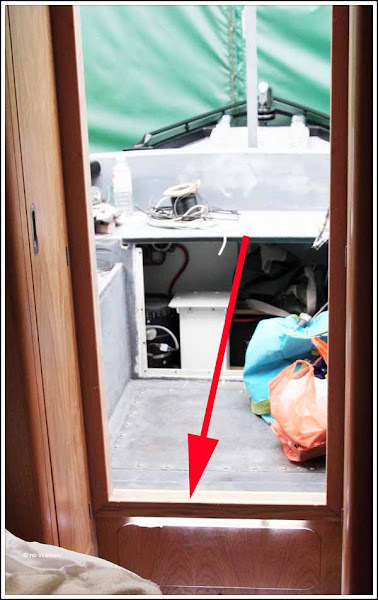 Fortunately the previously received comprehensive instructions from Mark Zimmerman of Atlantis Marine (the UK Empirbus supplier) enabled me to quickly resolve the matter. Now the light can be activated by what was the spare switch in the bedroom. 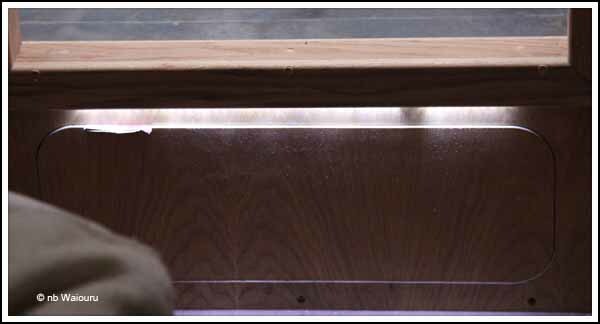 The second LED has been fitted below the front door on the inside step. Note the trim around the door. It’s so well fitted you’d think it grew there! It was Nick’s first day back after his holiday and he continued with the installation of the central heating. We are short one ‘finrad’ so he couldn’t complete the saloon. However he has installed the wall heater in the bathroom. He queried why we had chosen an “ugly” radiator rather than a “nice” heated chrome towel rail. I explained we wanted to be WARM and the double radiator generated 800 watts whilst the towel rail was rated at 150 watts. 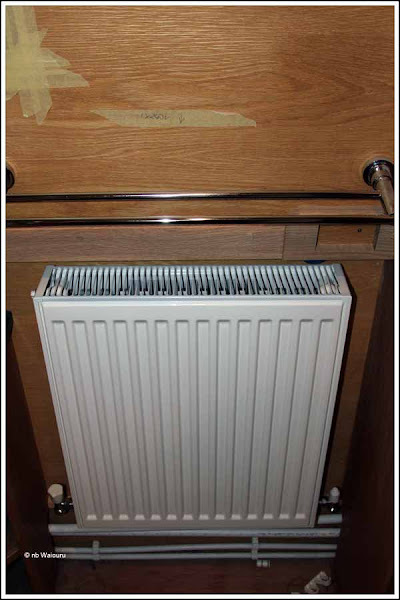 You may be able to see the double chrome towel rail immediately above the radiator. 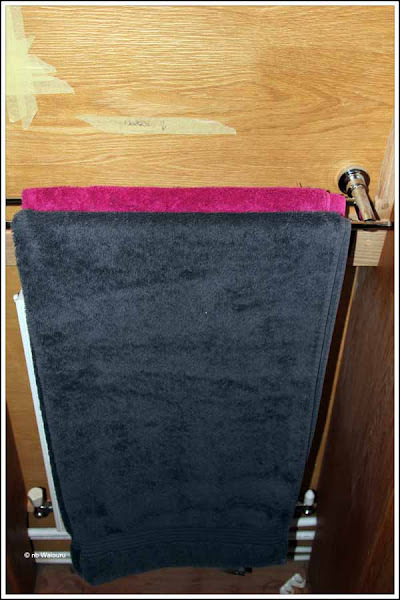 So when we have our towels in their usual position it looks like this…. The towels should be lovely and warm. Also, there should be room under the radiator for our shoes and slippers. With a little luck and good planning the radiator should keep the bathroom and toilet warm. Nick also laid out the finrads for the bed footlocker. There will be one in each half with a vent at either end. The intention is the finrads will warm the clothes in the locker but also assist in heating the bedroom. 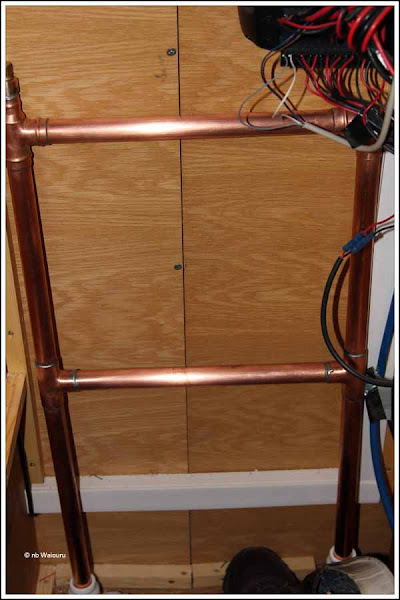 Nick also started making tube radiators from copper pipe for the two wardrobes. 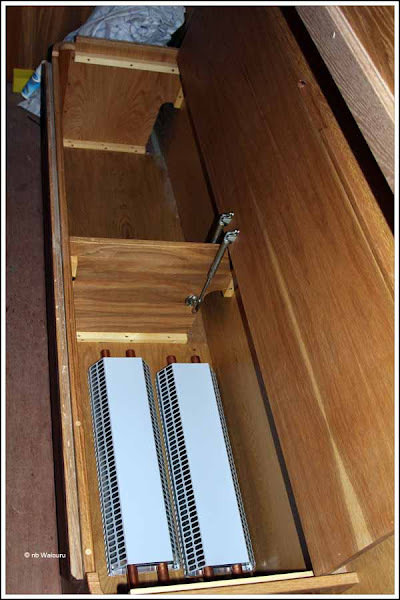 The intention is these will keep the wardrobes warm and also provide some heat to the bedroom. After he has made these two heaters Nick will be making a large double ‘T’ from copper piping which will go under the bed. This will keep the clothes in the drawers under the bed warm and dry but also warm the bed. There will be vents either side of the bed to allow the heat to escape into the bedroom. Meanwhile Darren continued with the painting. 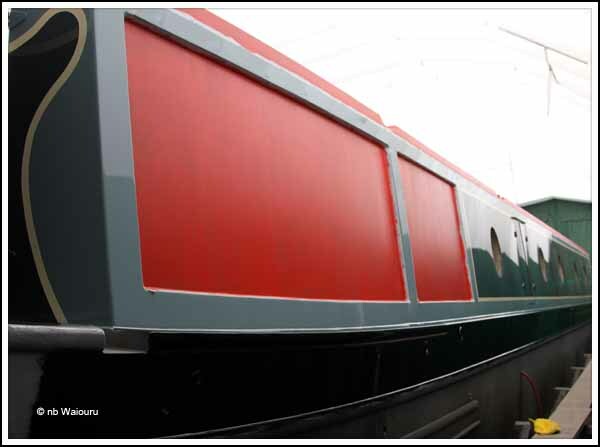 The handrails, boatman’s beam and recessed panels were all masked before he started applying the first coat of red undercoat. He also painted the first topcoat onto the gunwales. Tomorrow morning he’ll be sanding before painting the second red undercoat and the final black topcoat onto the gunwales. My task will be to remove the foam tape from around the portholes and then apply new tape before fitting the portholes to Waiouru. Fitting will have to be done in the morning whilst Darren is sanding because in the afternoon he will be painting the gunwales. I’m not quite sure if I get this right but I must say that it’s pretty neat and two thumbs up for the impressive job.